Part 2 in a series on refreshing your approach to business success. Let’s get radical! Let’s do something crazy! Let’s face it, you’ve read all the articles about clearing the piles on your desk, the files on the floor and getting organized. Have they helped, or does your desk still look like mine? That’s what I thought. So let’s try something different. Any fans of the TV series “Clean Sweep“? I have watched it occasionally and enjoyed some parts of it. I guess what I like best is the idea of taking everything out of a room, closet, or even a whole house, and re-evaluating what needs to be there, and where it needs to go. I know most of us aren’t going to move the contents of our entire house out into the driveway, but we can use the method on our desks. Now don’t panic. You will like the results. Let’s try the clean sweep method, starting with just the junk on our desks. Find a big box to put paperwork in. “Clean sweep” that desk. All paperwork and files go into the box. All equipment except the hard drive, monitor and keyboard are removed to the floor. Clean that desk. Mine is made of oak, so I use good Old English, but use whatever you need to get it clean and smelling nicely. Recreate your workspace. Is your monitor really where you want it? Do you need to rearrange the cords to make it easier to get to your equipment? Make sure the things you use daily are easy to reach. Replace the printers, scanner, scale and other equipment, carefully and thoughtfully. Place each item where it is easy to use and not in your way. 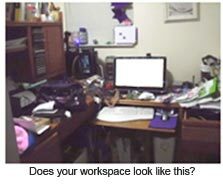 And if you don’t use an item daily, really consider if it could be stored somewhere other than your desk. Your desk is your launching pad, your command and control center for your business. It should be organized to suit you. Decorate. Do you like candles or room fresheners? Maybe one or two small pictures of your family? Tissue in a pretty box? A decorative calendar in your taste? Your desk is where you’ll be spending a lot of time. Make it a pleasant place to be. Now it’s time to deal with the paperwork in that box. There are many filing systems out there, and I’ll leave you to find the one that works for you. However, these four files should be within easy reach at all times: “To File,” “To Call,” “To Read” and “Waiting On.” Perhaps just a small accordion file for each of these—a pretty one—could be on your desk daily. Put it away under the desk each night so that a “clean sweep desk” welcomes you to work every morning. Hey, one can dream, right? Respected as a trusted e-commerce speaker, educator and entrepreneur, Kat Simpson has been a successful e-commerce merchant for more than 10 years. Simpson is an eBay education specialist and Silver PowerSeller, who also maintains stores on Addoway, Bonanza, Buy.com and iOffer. She is the co-host of the popular weekly e-commerce podcast, eCom Connections. Connect with Simpson on Twitter and Facebook. Opinions expressed here may not be shared by The Online Seller and/or its principals. Kat, thank you. I don´t know what is “Clean Sweep” but this helped me a lot! I thought I don´t have a time to clean my desk, what to do first, so I just let it be, for later… 🙂 This kicked me up and I did it this morning! Yey! Maybe it´s not your idea, but I thank you for posting. Thanks Kat, maybe it´s not your idea, but it kicked me up 🙂 My desk is clean and smells good 🙂 One little step to clean my office 🙂 Thanks again. Clear out the cabinet that holds your pots and pans, taking everything out to a not-too-easy place to retrieve, like your garage. When it comes time to use one of the pans that cabinet held, go out to the garage, get that one pan, leave everything else – continue to do this for several days, bringing in only that which you actually need for that meal. At the end of a week or so, it becomes obvious (with what is left in the garage) what you don’t need/use. You can then either donate it or sell it (just don’t bring it back to the cabinet:). Great advise about the filing system. I will try it. so glad y’all liked it – I think the effect is great for our focus! Gail, I love Heloise Tips too! Thanks for reminding me for what I have know for years…you are right on. The one thing I always have on my bare desk is a daily prayer “flip” book. great little ready mad prayers for almost everything…(when I am tired, depressed, stuck in a place I would like to move on from etc.or to remind me how blessed I am). Get them at Hallmark etc. to remain humble and bow down to a Higher Power in my life…EVERY DAY.